Owing to our rich industrial experience, we have emerged as a trusted Manufacturer, Supplier and Exporter of Test Sieves from Varanasi, Uttar Pradesh, India. 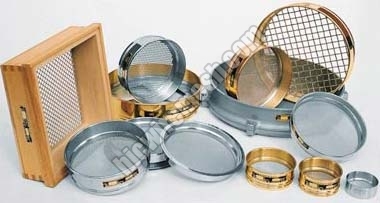 The Test Sieves offered by us are made using finest quality Stainless Steel wire mesh and Brass Frames of 200mm diameter. High durability, reliable performance and premium quality are some of the attributes of our Test Sieves. We are capable of delivering bulk orders of the Test Sieves.